NOAA’s Joint Polar Satellite System (JPSS-1), the next generation polar orbiting weather satellite, is set for launch in mid-November 2017. Our Road to Launch series takes a look at initiatives by researchers at the UW-Madison Space Science and Engineering Center (SSEC), the Cooperative Institute for Meteorological Satellite Studies (CIMSS), and partner agencies to calibrate and validate the data from the satellite’s instruments. Our scientists will use these valuable atmospheric data for research and to create products and applications that will improve weather forecasts. While scientists at the Space Science and Engineering Center (SSEC) and the Cooperative Institute for Meteorological Satellite Studies (CIMSS) have been celebrating the launch of GOES-R (now renamed GOES-16), they are also anxiously awaiting and preparing for the launch of another meteorological satellite. It, too, will be the first in a new series—the next generation of polar-orbiting weather satellites. A collaborative effort between NASA and the National Oceanic and Atmospheric Administration, the Joint Polar Satellite System (JPSS) is scheduled to launch its first satellite, JPSS-1, in less than a month—on 10 November 2017. And as with GOES-16, SSEC and CIMSS scientists are working to make sure the instruments on board JPSS-1, as well as the measurements to follow, are properly calibrated and validated. Those assessments are vital in order for scientists to use the data to improve weather forecast models and climate studies. SSEC and CIMSS scientists are focused on two JPSS instruments: the Cross-track Infrared Sounder (CrIS) and the Visible Infrared Imaging Radiometer Suite (VIIRS). “We’ve been involved with the new instruments since the beginning for both CrIS and VIIRS,” says Dave Tobin, SSEC senior scientist. In fact, there is a strong connection between SSEC and CrIS, owing to a long heritage of not just sounding research, but specifically hyperspectral sounding research. The instrument will continue the record of high altitude observations of cloud motions from polar orbit, a concept that began at SSEC nearly 50 years ago with the plan to measure winds to improve forecasts. JPSS-1 has one unique advantage that GOES-16 did not: essentially duplicate versions of the JPSS instruments are currently orbiting the Earth on the Suomi National Polar-orbiting Partnership (NPP) satellites. While that arrangement reduces much of the risk and the number of unknowns, the effort to calibrate and validate the instruments and data remains critical. The Cross-track Infrared Sounder (CrIS). Credit: NOAA. The CrIS instrument to fly on JPSS-1, however, is not exactly the same as that on NPP, though both were built by the Harris Corporation. 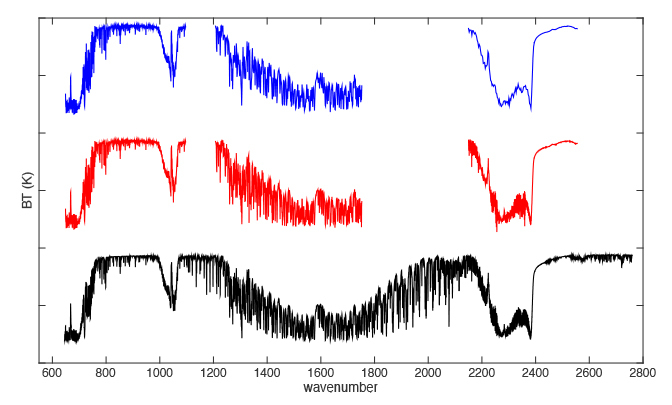 The spectral resolution is higher and the radiometric calibration has been improved, which should lead to more accurate data. Tobin noted that SSEC scientists have been very involved in the instrument development process, from the pre-launch design and testing to post-launch plans to assess the quality of the CrIS data. Approximately a month or so after launch, the instruments will be cleared to be placed into operational mode, at which point they will begin taking measurements for “first light images”—those eagerly anticipated earliest publicly available images. At the same time, SSEC scientists will be assessing the data and products as they go from one level of maturity to the next: from beta to provisional to validated. “At each level there is more and more scrutiny put on the data and little tweaks to change the calibration a little bit,” says Tobin. And the sooner the data are validated and can be used, the better. JPSS-1 will have the same orbit as Suomi NPP, but they will be separated by 50 minutes—making them 180° out of phase, or on exact opposite sides of the Earth. “The observations are separated from each other as much as possible so that they’re independent and add more information,” says Tobin. Example clear sky brightness temperature spectra for CrIS at Normal Spectral Resolution (blue), CrIS at Full Spectral Resolution (red), and IASI (black). Credit: Dave Tobin, SSEC. That configuration adds a layer of complexity when assessing the quality of the JPSS data as the two CrIS instruments are not viewing the same scene at the same time and cannot be directly compared. Instead, scientists bring in data from another polar-orbiting satellite instrument, the Infrared Atmospheric Sounding Interferometer (IASI) on the European MetOp satellite series, and use the Simultaneous Nadir Overpasses (SNOs) that occur near the poles when IASI and one CrIS or the other are crossing near the pole at the same time. “So we’ll compare JPSS CrIS to IASI. And then separately we’ll compare Suomi NPP CrIS to IASI. You take the difference between those two, and the IASI drops out. So it’s just the difference between the two CrIS [instruments], statistically,” says Tobin. SSEC scientists have extensive experience with this method as it was used when they compared data from two IASI instruments on separate MetOp satellites with data from the Suomi NPP CrIS. Scientists also need to address the issue of detector non-linearity, as the detectors initially do not always capture temperature changes as they should. While scientists characterized the non-linearity during thermal vacuum testing which simulates the space environment, it may change as the instrument is exposed to temperature swings, particularly those at launch, notes Lori Borg, a researcher at SSEC. A post-launch assessment will re-examine the non-linearity issue and determine whether additional corrections are necessary. All these efforts aim to improve the accuracy of weather forecasts as the main use of CrIS data is in numerical weather prediction (NWP) models. Tobin explains that CrIS data from Suomi NPP are finally starting to have a large impact on those models, which in turn produce forecasts. He attributes that success to a noise covariance matrix recently introduced into NWP models. “CrIS has significantly lower noise than other sensors like it, such as AIRS and IASI. If you have data that’s noisy, there’s a lot of wiggle room. With CrIS the noise is much lower and so all these other little sources of error [such as in the radiative transfer or in the model itself] had to be characterized much better,” says Tobin. And the improvements due to the noise covariance matrix are notable. Tobin states that the European Center for Medium range Weather Forecasting (ECMWF) has already remarked on the positive impact CrIS data has had on their forecast model. SSEC scientists are also looking ahead to additional advances that might be possible with changes to the CrIS instrument for JPSS-2 and later. Specifically, they are advocating for filling in existing spectral gaps and smaller footprints. Agnes Lim, a CIMSS research associate, is conducting an Observing System Simulation Experiment (OSSE) that is examining the impact of a smaller footprint on the forecast model. The current CrIS footprint of 15km increases the risk of cloud contamination, which affects the use of the data in the model. Smaller footprints would reduce the amount of cloud contamination. A smaller footprint would also correct the current mismatch between footprint size and model grid size. “As NWP models go with smaller and smaller grid sizes, this [change] would complement that,” says Borg. 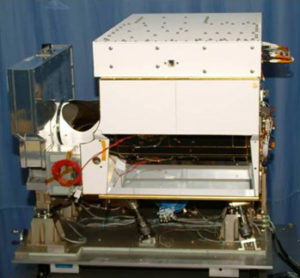 The Visible Infrared Imaging Radiometer Suite (VIIRS). Credit: NOAA. 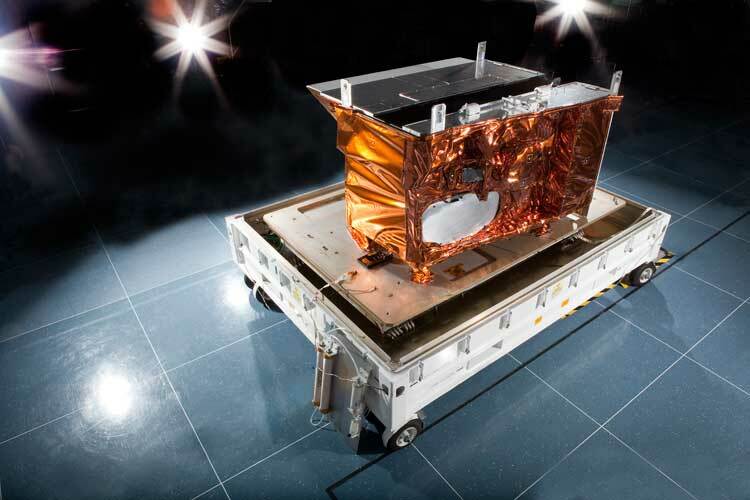 While the VIIRS instrument designs are virtually the same, as with CrIS, the JPSS-1 version will benefit from technical upgrades based on the experience with the version on Suomi NPP, with those upgrades designed to improve performance. “The JPSS-1 VIIRS spectral filters for the VisNIR [Visible Near Infrared] bands were redesigned to reduce scattered light, improving the spectral purity of the filters. The mirror coating process in the fore optics was also reviewed to eliminate on-orbit degradation of mirror reflectance due to solar UV light illumination,” writes SSEC scientist Chris Moeller in an interview over email. Moeller’s involvement with the VIIRS instrument began long before launch. Once construction of VIIRS was completed, its radiometric, spectral, and spatial performance were characterized during a series of tests. Moeller participated in the spectral testing at a Raytheon Space and Airborne Systems facility in El Segundo, California; Raytheon built the VIIRS for both Suomi NPP and JPSS-1. The test allowed Moeller and others to observe the instrument’s spectral performance and note any issues that Raytheon should address before launch. “Importantly, the pre-launch test program is the only opportunity to directly characterize the spectral performance of VIIRS so we really want to make sure we’ve captured the spectral performance with comprehensive high quality measurements,” noted Moeller. VIIRS relative spectral response characterization for all bands of JPSS-1 (shaded pink) and SNPP (blue profile). Response includes the specified high response zone of the in-band region plus any out-of-band response caused by filter leaks and/or crosstalk. Much of the out-of-band response in the VisNIR bands (I1, I2, M1-M7) of SNPP was eliminated by redesigning the filters for JPSS-1 VIIRS. Credit: Chris Moeller, SSEC. Once JPSS-1 reaches its designated orbit, a new round of tests will commence to verify if VIIRS is performing as expected. 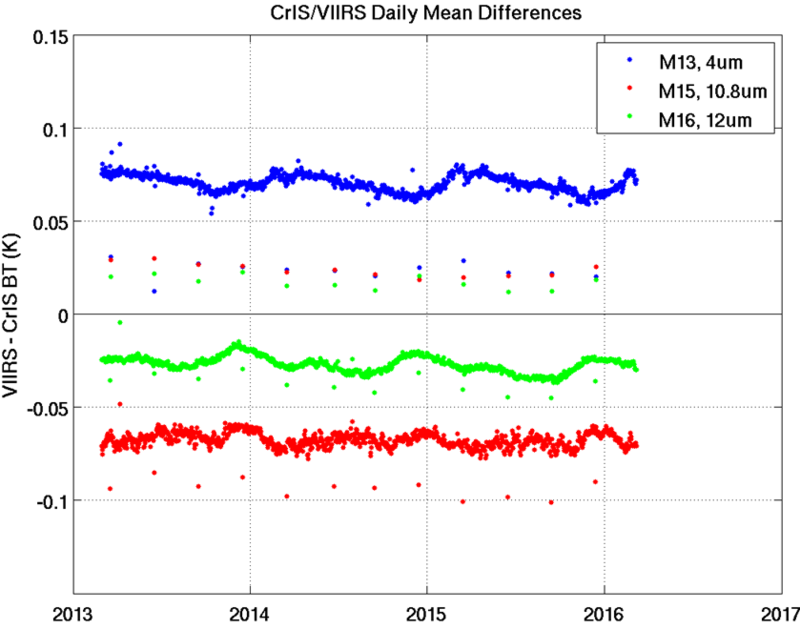 SSEC scientists will compare data from VIIRS to other instruments on JPSS-1 (such as CrIS), as well as to instruments on other satellite platforms (such as IASI on MetOp-A/B), to look for biases that may affect the measurements. That information will inform whether or not scientists need to alter the VIIRS radiance algorithm to ensure accurate data records. “This evaluation of biases between VIIRS and other on-orbit sensors is a critical element of preserving climate quality measurements over the decades of multi-sensor observations that will be needed to support climate change research,” wrote Moeller. SNPP VIIRS Sensor Data Record (SDR) comparisons to CrIS SDR demonstrating the close agreement and excellent stability of both sensors over the mission. Periodic (quarterly) departures from that behavior are due to special VIIRS instrument warmup-cooldown exercises that support on-orbit calibration verification. Credit: Chris Moeller, SSEC. Moeller went on to add that they have been conducting similar research using the VIIRS on Suomi NPP, which has been proven to be remarkably stable. With the expected 10 November launch of JPSS-1, Moeller anticipates that the first light images for VisNIR bands will arrive in early December, with the first light for the thermal bands to arrive in late December. Once all the bands have come online and are collecting data and the instruments have undergone an initial checkout period, scientists will then rigorously examine the data quality as it moves from beta to provisional to validated— with the goal of reaching validated within 20 months after launch.